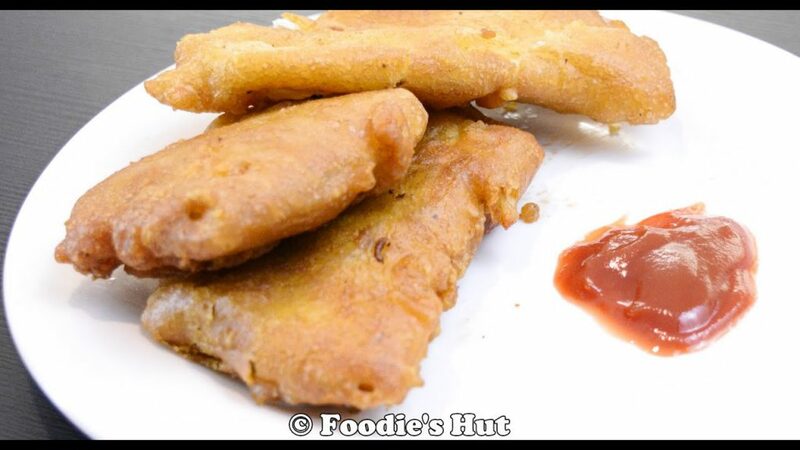 Kolkata style Fish Batter fry is one of favourite starter in the Menu for a Bengali functions! As Indian cooking influenced by many other cuisines and British food has a huge influence in Calcutta cuisine. This recipe is a Bengali version of British Fish and Chips. Approx 750 gm of fish fillets sliced. Each slice should be 60-70 gm of a piece. In this recipe, I used Barramundi fish fillets, but one can use Cod or Basa fish too. In a mixing bowl add all ingredients for marinade and fish fillets, mix everything well, transfer it to a plate and cover with plastic wrap. Fill a heavy-duty pan halfway with oil and bring it to temperature over medium heat. Then, into the same mixing bowl combine flour, cornflour, baking soda, powder, pepper, salt and sugar, with a help of a spoon or fork give a whisk to mix everything. In a mug or cup crack eggs, add oil and with a help of a fork whisk it. Add soda water to the beaten egg mix, give a quick whisk. Pour the wet mixture into the dry mixture and mix until they are incorporated and form a smooth batter. Take one piece of fish fillet, add to your batter and drop it into the hot oil, y fry 2-3 at a time to avoid overcrowding. Cook the fries about 3-4 mins or so, until they develop a deep golden brown colour. Remove from oil, drain them on paper towels and serve them hot with tomato ketchup.